Do you have the Act Two Blues? Having problems with the middle of your screenplay? Running out of steam halfway through? Getting caught in subplots and slow spots? You may be having Act Two problems! Act Two has a reputation for being the hardest to write. 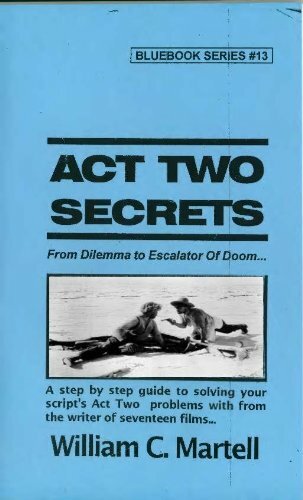 This Blue Book will take you through the desert of Act Two, showing you how to solve those Act Two Blues! Subjects Include: What Is Act Two? Inside Moves, The 2 Ps: Purpose & Pacing, The 4Ds: Dilemma, Denial, Drama and Decision, Momentum, the Two Act Twos, Subplot Prisms, Deadlines, Drive, Levels Of Conflict, Escalation, When Act Two Begins and When Act Two Ends, Scene Order, Bite Sized Pieces, Common Act Two Issues, Plot Devices For Act Two, and dozens of others. Over 67,000 words (that’s well over 200 pages) of tools and techniques to get you through the desert of Act Two alive!